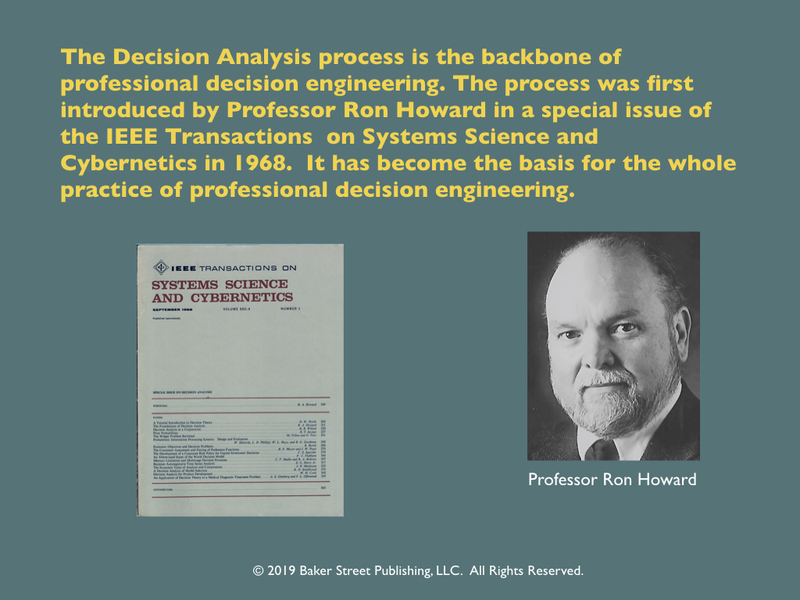 This 63-page slidedoc will help decision engineers and decision coaches explain the decision analysis(DA) process to their teams or clients. The DA process combines decision theory, systems analysis, and applied probability in a normative way. The process was originally developed by Professor Ron Howard at Stanford University. This process has been used by professional decision engineers for the last half century. It is used by corporations around the world, the military, and at all levels of government. A life-cycle cost comparison of the Chevrolet Volt and the Toyota Prius, is used to explain the phases of the process. The case study illustrates how popular tools are used by practicing professional decision engineers. The process proceeds from a deterministic modelling phase to a probabilistic phase. In the deterministic phase a spreadsheet model is used to capture key physical and economic relationships and to prioritize issues. In the probabilistic phase the top uncertainties are treated using probabilities. Once the decision is modeled and probabilities are assigned it is a straightforward matter to determine the economic value of getting better information on specific issues. 7) Calculating value of information. The spreadsheet model used in the case study is available for purchase. You can use the spreadsheet to compare any two alternatives. Results include cash flows, median case numbers, tornado diagrams, cumulative probability distributions, and flying bars.